Beautiful pattern, just loved knitting these. It is not often my late-night moments of inspiration digging through the stash and buying patterns online actually last long enough to get things finished within a reasonable amount of time. But these were a really nice knit, I struggled a little with the braided edging but as always I couldget help from Ravelry, and I already have ideas for how this could be used in other garments, it is such a nice detail. The stranded knitting goes from very simple to more concentration-demanding as you move from trunk to twigs, but as the designer points out, noone will ever be able to see any “errors” in this irregular pattern. I just love the graphic, almost print-like feel this pattern has, and it would look beautiful in so many colour combinations. I’d love to see them with white trees against a dark background. The designer has done a great job recreating the silence and calm atmosphere I feel when surrounded by naked trees. I’m not sure what I think about mittens in superwash yarn, they are a little floppy and don’t have the texture and firmness of a slightly felted pure wool, on the other hand the colours won’t blend and make the design fade with time, especially important with these as there is no right and left mitten, and no palm and back side of the hand. And they are warmer than I tought so they might be upgraded from summer to spring-and-autumn mittens. Teal and lavender spots in the yarn make little stripes on the black and grey trees, like real birches. Although it will be another three months until the leaves come out here, the seasons change so fast this time of year. We have gone from winter with no sun to long, light, bright days, plenty of snow and the sun really warming during the day. Nothing like what you would associate with spring but still very different from midwinter around here. No wonder the the indigenous Sami people divided the year in eight seasons. We are now experiencing winter-spring, the snow will stay for quite some time still but it won’t be many weeks until we have no darkness at all. Pattern: Thrummed mittens. Used a cross between the Interweave version and the pattern on the yarn label. What took me so long? I clearly remember that when I started these about two and a half years ago it was in one of those ohdearIhavetoknitthisNOW! moments. That moment lasted until I had completed the second cuff. I remembered this project every time I’ve been waiting for the bus in freezing winds. Clearly even that wasn’t motivation good enough , and a few months ago I decided I wouldn’t knit socks until I had finished these. I like knitting socks. Since then I have bought and been gifted some very nice sock yarn. But I haven’t knit any. For myself. These are so small that they hardly count. My standard top-down sock in 6-ply sock yarn over 36, 40 and 44 sts, hopefully corresponding to 1, 3 and 5 year old feet. I ran out of rowing for the thrums, but had some turquoise rowing in my stash that fit exactly. The second mitten came out a lot fatter than the first one…so fat I had to turn it inside out an trim the thrums. Now I can bend my hand while wearing it and it feels less like a boxer’s glove. I think this is the kind og knit that I will either wear to pieces, or not at all. Finally I could pick up one of my sock yarn gifts and start a new project. Ahem. Holidays were good, relaxing, lots of food, family and good times. I taught a cousin to knit cables and picked up some yarn from my mom’s stash. I also scored a new ballwinder when I mentioned that the old one that was already old when I got it, was broken. She happened to have another old one lying around. That stash is a goldmine. Time to close up the old year. Some things turned out well, others not, both in knitting and in life. My first year with a permanent job, and my first year as single, living alone. I met some wonderful new friends and have lots of old ones. Some things weren’t resolved this year, and there are unfinished projects (again, both in knitting and in life) that will colour 2009. I’m excitedand a wee bit . They came a bit uneven and big in size, but Mom said she’d felt them to fit. Om the picture they are laying on an old washing/felting board used by her family. Actially it is probably not that old. Those things wore out from felting all the socks, mittens and warm felted woollen winter footwear. I like that this one is still in use. I decided she needed some handwear for porfessional use as well. She is a kindergarden teacher. Enter the Pinch Me! glove. When wearing this, it is impossible not letting the hand crawl along some edge, poking someone..! I’ve made a few of these earlier. The pattern makes a great, well fitting mitten, but until the ends are woven in and the eyes are on the thing on the needles look…well…it just really helps getting those eyes on. The only downside is that there is a LOT of ends to weave in. The body is entrelac, but the mitered squares for the tail…lots of ends. 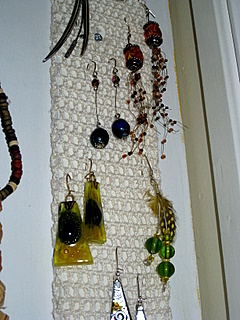 Still, I’m sure I’ll make even more of tese at some point, and it is a great way to use up leftover yarn. I modified it to worsted yarn by casting on fewer stitches for each element. Yarn: Dale of Norway Tiur, colour 2722 natural, 9853 green (4 balls each) and 2343 brown (2 balls). I was actually asked to make this for his birthday, a loong time ago. He likes to have a little blanket over his belly when reading the paper or napping. I meant to take an “action” shot but you get the idea.. I wanted a blanket that looked ok on both sides, had some geometrical elements, didn’t involve a lot of ends to weave in, and that allowed me to knit until I was out of yarn. It took a long while and and many unenthusiastic attempts at various patterns before I found something that fit my requirements. I ended up doing a modification on the diagonally mitered squares from the Posey sock pattern and this has been my TV knitting all autumn. I’d like to do a baby version in some nice colours and write down what I did, if I can remember for that long.. 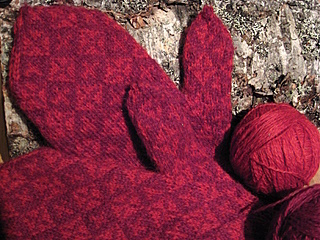 There is yet another pair of mitered mittens on the way that didn’t make it under the tree in 2008. All I can say is that the old Romans gave New Year’s presents. A very happy, warm and wonderful New Year to all of you! Much time has passed since I left a life sign in this part of the cyberspace. Not so much have happened around here though, and I can only think of two things worth mentioning. We have snow. Not anymore. It would have been a good thing cause the days are really short now and weekends are my only chance to get a glimpse of daylight, if only it wasn’t raining and the only sane thing to do is to stay inside by the fire, drink coffee and knit. Not that I mind. I knit a pair of mittens. The yarn is a sticky wool-quality and it took a while getting used to, especially for stranded knitting. But I imagine it is quite similar to the original Faeroe yarn, but I am not sure at all…I am always skeptic when something is presented as “folk” or “historical” or “authentic” and I have been really disappointed sometimes when browsing through pattern books with those topics. Often just a single design element or border or colour is used, but in a completely different context. Other times I’ve been really fascinated by the stories, only to discover lots of error or disinformation in the Norwegian section that led to mistrust in the whole book. Not that there is anything wrong with folk-inspired knitting, but I think it is important to remember that even though something may be authentic for a certain and often very limited area or time-period, and history is always changing, one should strive to be true to the original idea or clearly say “this isn’t how it has been done, but this is my way of doing it after being inspired by this and that and that’s OK too”. I guess original Faeroe mittens were similar to the working mittens or sea mittens I know from my area, knit on large needles of loosely spun natural grey wool and felted to size. 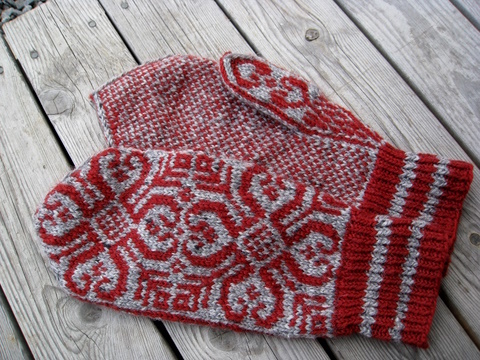 The pattern here is based on a pattern from men’s Sunday vests and adapted to mittens, not sure if such have ever been knit on the Faeroe Islands but beautiful nonetheless. Other patterns in the book have other inspirations, but the stories and the sources of inspiration are there, the patterns are well-written and the mittens beautiful. And the technique section with different constructions of mittens and thumbs is brilliant! The mittens are made to match my softshell jacket and I think they do perfectly, I have worn them lots already, but will handfelt them slightly to make them even snugger and warmer, I was afraid the pattern wouldn’t show at all but it came out just as subtle as I’d imagined. Thin, but really warm. I really should knit more handwear, I need that more than socks but once you’re sucked into the sock knitting there is no way out… I’ll try though, by announcing here that I’ll finish these before I start a new pair of socks. 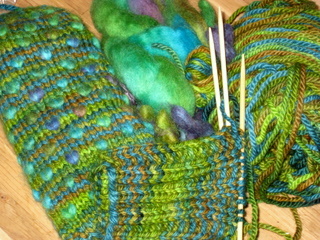 Thrummed mittens, a kit from Fleece Artist bought at a visit to Yarn Forward in Ottawa years ago. Given the thick yarn you’d think they take less than 2 years to complete. Think again. Pattern: From a book on the history of mittens that I found at the library and can’t remember the name of..
Yarn: Peer Gynt colour 242 red and some grey with a lost ballband, 2 balls each. When I go to the library I often end up in the hobby section browsing books thinking “why on earth will people spend time and money on flowerbinding? Fly fishing? Model trains? Stamps? Or even crochet?” And then I load up on books with knitting patterns, knitting techniques and knitting history, confident that I am very smart, clever and wise to spend lots and lots of time and money to play with two sticks and a string. In one of those books I found this pattern for a man size Norwegian mitten and liked it so much that I immediately made a copy. In fact, I like it so much that I am considering knitting it for myself with thinner yarn. And because I lost my last pair of favourite mittens on the bus this winter and the bus company had given them to Salvation Army before I had a chance to pick them up. Hope someone appreciates them. These mittens were made as a birthday present for my Grandfather, who in spite of being closer to 90 than 80 needs something to keep his hands warm on his daily mile-long walks. ( Metric miles that is.. I took the bike to work today. Yay. ) I found some other patterns that I used as a base to get started with the cuffs and thumb increases, and kept the inside of the hand in a 1×1 checkerboard pattern, not just because it is the easiest of all and uses the same amount of both colours so you avoid too much yarn tangling, but also because it creates the warmest and most wearable fabric. I had to make up a little pattern for the thumbs but it came out OK. The best of all is that I can see how much better and more even my stranded knitting has become after the dominant yarn exercises with the Zebra hat. I really think I will knit a pair of Norwegian Mittens for myself for next winter. My mother made this to organize all her earrings and I think it turned out like a little piece of art in the bathroom. It is just a piece of painted wood covered with a crocheted mesh and you can make it any size you need to accommodate your bling-bling. Actually I’m sure you could use a knitted mesh as well…maybe a lace panel or a cable along one side?